Billy Tea Safaris offers guests the chance to see the Chillagoe Rainforest in custom built 4WD vehicles, where they can ride around in comfort, enjoying the sites. Your naturalist guides have extensive knowledge of the flora, fauna and history of the area as well as Aboriginal culture, ensuring your day leaves you with memories to last a lifetime. Local Chillagoe Gift shop is a must see! Your naturalist guide will meet you at your accommodation and after introductions all round, we'll ascend the McAllister Ranges and head west through Mareeba embarking on a remarkable journey back to prehistoric times, when dinosaurs ruled the Earth. Our first stop is for morning tea (Coffee & Cake). From here we travel through the back blocks of this wetland area viewing wallabies, emus and other wildlife and then along the irrigated agricultural paddocks of this fertile area, eventually crossing over the Great Divide and into the Western watershed. 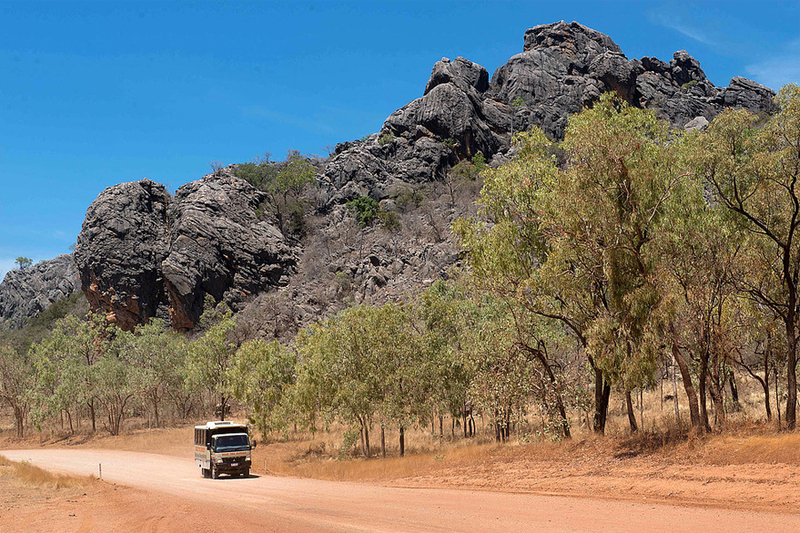 Travel through historical towns and rolling hills rich in minerals eventually giving way to towering limestone karsts scattered around Chillagoe. Our first stop is the National Parks Cave tour. The fossilised remains of the ancient coral reefs with hidden limestone labyrinths give a portal to a lost world just like our own Great Barrier Reef. Millions of years in the making, the limestone formations are nothing short of spectacular. We then delve into the history of the copper smelters; whose old chimneys dominate the western horizon. We visit the remains of the once mighty smelters to ponder what it was like working there, visit Aboriginal Rock Art and then it's time for an Aussie pub lunch. After lunch and a visit to the local souvenir shop, we head back towards the east coast, stopping at Granite Gorge where we can feed wallabies and hold other indigenous animals. The tour then returns down the range to Cairns. Northern Beaches at 7:35am approx. Port Douglas at 6:00am* approx. Northern Beaches at 6:00pm approx. Port Douglas at 7:00pm* approx. *Port Douglas transfers are an additional cost. A reasonable level of fitness is required for this tour as there are steps into the caves, uneven ground. The tour may be closed or itinerary changed due to the wet season where conditions may close roads and access to the caves. Please ensure that you wear closed in footwear for the cave tour. Flip flops and high heels are not suitable for this tour. Please wear comfortable walking shoes and pack a small day bag with swimwear, towel, hat, sunscreen, sunglasses, sweater (for colder months) camera, water bottle and cash for additional drinks and snacks. - Transfer from Port Douglas with an additional cost of $99.00 per person payable to guide on board. - Environmental & fuel levy may apply. Thank you for booking with Mr Travel If you would like any advice or assistance in arranging accommodation, transfers or additional tours, please do not hesitate to contact us.